Explore this sensational work by the famous Antoni Gaudí! Barcelona is known throughout the world as the capital of Modernism, the greatest advocate of which was the famous Catalan architect, Antoni Gaudí, who effectively dedicated his life to the construction of the emblematic basilica of the Sagrada Familia (Holy Family). An intrinsic historical work full of symbolism and links to nature which can only be fully understood and appreciated with an expert guide at your side.Thanks to the shared Tour of the Sagrada Familia, it is possible to visit the basilica accompanied by a local guide at a cost of just €42.00 per person which includes the entry tickets! At the end of the guided tour, you can spend as much time as you like admiring the basilica. The sun's rays as they filter through the multi-coloured windows create a spectacle unlike any you will have everf seen before. The guided tour starts from the gardens in front of the Passion Façade. In this wonderfully picturesque setting the guide begins to relate the history of the basilica's façades and its majestic spires. Having come through the gardens, you will reach the entry to the basilica and after having collected your headphones which will enable you to hear better and ensure that you don't miss any of the details that are being provided by the guide, you will continue through into the interior of the museum. Here you will be able to see the various phases of planning for this iconic work and find out some of the curiosities that relate to the building's construction. 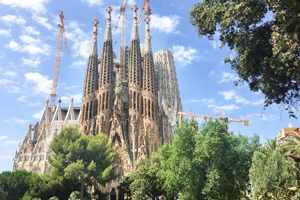 You will then continue on towards the imposing entry doors to the basilica which were designed by Gaudí and brought to life by some of the most celebrated craftsmen of the time. Here you will be told about the significance of the many hidden details and about the statues that tell of the birth of Christ. The real spectacle, however, awaits you inside the building where millions of rays of light with infinite nuances of colour will immediately focus your attention and completely take your breath away. Here too, your guide will explain to you in detail about the significance of these precious stained glass windows which have a dual function: firstly, 70% of the light inside the Sagrada Familia is natural light and secondly....we'll let you be surprised by what your guide will tell you during this fantastic tour of the Sagrada Familia! Upon receipt of payment, you will receive an email confirmation that you will need to print off and hand to the guide on the day of your visit.